It is well-known that a group with a large eye space has a better chance of living. 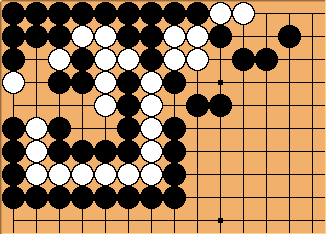 In particular, any group with a non-defective eye space of more than seven spaces is known to live independently or in seki; an example is butterfly seven which is guaranteed to live at least with a seki. However, a group with a larger eye space may be killed if its eye space contains defects. On this page, we study eye spaces created by the capturing a single chain of stones. In particular, we ask: What is the largest capture that still can't live? Igo Hatsuyoron contained a famous life-and-death problem where a 16-stone chain is captured but still can't live, and for about 300 years 16 has been taken as the maximum number. On 2004 May 1, Robert Pauli constructed a problem involving a 17-stone capture. This new record stood until 2009 September 9, when a 18-stone capture is constructed. As of 2009 September 11, the current known record is 18 stones. asmobia? : Slighty modified Mr. Pauli's construction (below), published on Chinese Weiqi website: http://club.weiqi.tom.com/item_111_1383700_0_1.html, 2009/09/09. Yee Fan Tan: I composed this problem and listed it here on 2009 September 10. It is discussed at RTG Problem 59. asmobia? 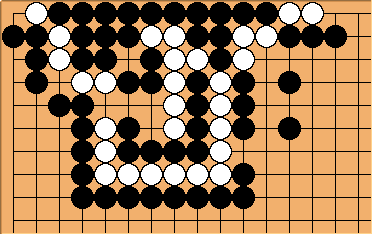 : I simplified the first case of 18 stones. 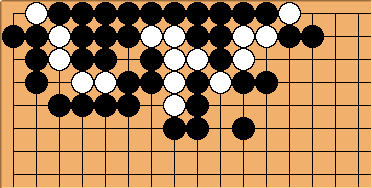 Robert Pauli: Improved Dosetsu Inseki's great construction (below) by one on 2004-05-01. As far as I see, the record is now at 17. 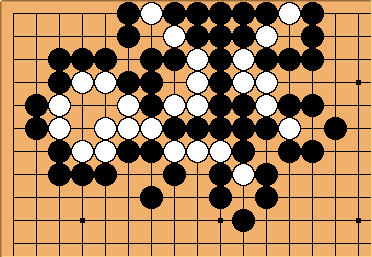 From Dosetsu Inseki's Igo Hatsuyoron. However, it is not sure whether he himself actually constructed this problem. Robert Pauli: ...according to JF's post on RGG, 1999-09-15. Initial ko capture added by me. There has been disagreements whether a move inside such a large eye space with defects is considered a nakade. It appears that Japanese professionals such as Hirose Heijiro and Hayashi and historians such as John Fairbairn consider it nakade. For example, John Fairbairn describes Hayashi's definition as follows: The base meaning is a "move inside". Hayashi does not restrict this to any particular shape except to say that the surrounding group is "continuous". 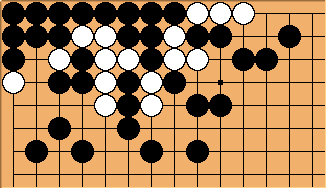 From the examples I have seen, it is safe to say that the shape into which the "inside move" is played is always fully enclosed. It may, however, have defects. On this page, John Fairbairn mentioned that a magazine claimed a nakade covering a 36-point area, but the actual problem was not made known.